Wash the cucumbers and cut the stems off. Peel the garlic. 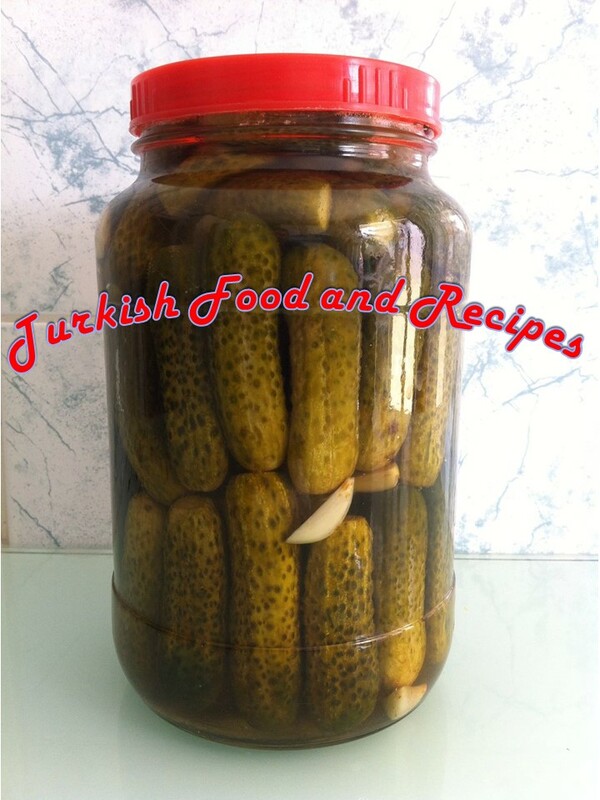 Try to fit as many cucumbers as you can in a glass jar (1/2 gallon). Add the garlic cloves in between. Then, add salt and vinegar on top and fill all the way up with filtered water making sure the cucumbers are all immersed in water. Close the lid and shake it upside down to mix up the vinegar and salt. Store in a dark and cool place up to 7-10 days. Depending on the storage temperature, the pickles would be ready to eat by then. Refrigerate after opening the jar. Salataliklari yikayin ve saplarini kesin. Sarimsak dislerini soyun. Tercihen cam kavanoza (2 lt’lik) salataliklari dizin. Aralarina da sarimsaklari serpistirin. Uzerine sirke ve tuzu ilave ettikten sonra, kavanozun agzina kadar su ile doldurun. Kavanozun kapagini kapatin ve ters duz edip sallayarak tuz ve sirkenin iyice karismasini saglayin. Karanlik ve serin bir ortamda yaklasik 7-10 gun icerisinde (ortamin sicakligina bagli olarak) tursu yemege hazir duruma gelecektir. Kapagini actiktan sonra buzdolabinda saklayin. I prefer to make blanks for the winter on my own, and not to buy them in the store, so your recipe has interested me. You can be sure that I will make this coarse. Thank you for the recipe and until we meet again.